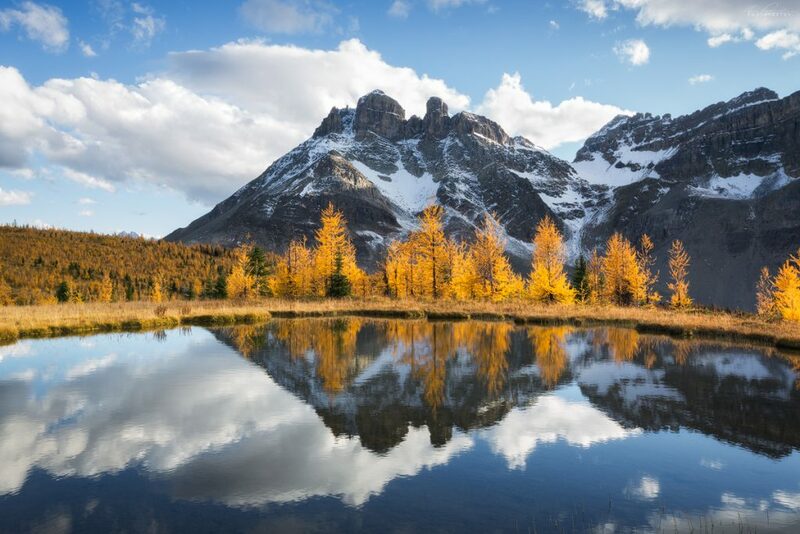 If you are planning on visiting Banff, Canmore and The Canadian Rockies then take a read through this guide on what sort of weather to expect, especially if you are coming to take great photos! This will give you an idea of when is the best time to visit Banff National Park and its surrounding areas based on your goals. 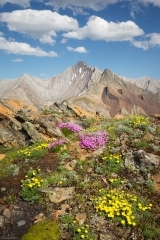 I will give you some tips and advice on which areas might offer you the best photographic opportunities in each season. 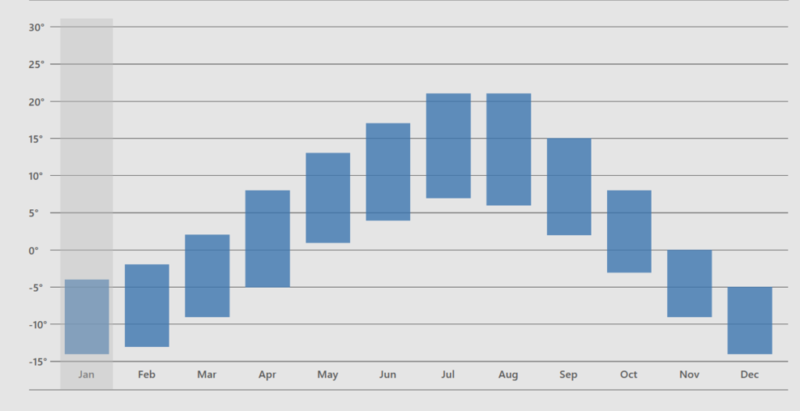 These graphs are just a guide as mountain weather is very unpredictable and can change rapidly. I’ve seen snow in every month! It is also important to know weather is very localized too. 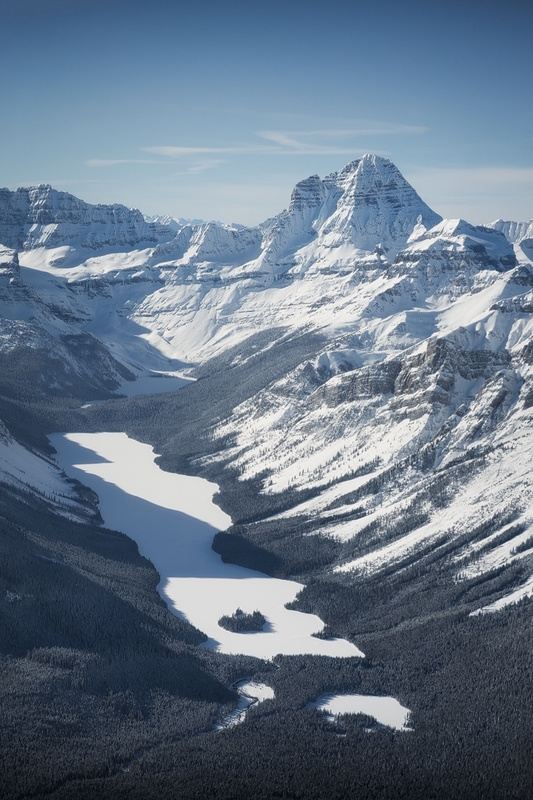 These numbers increase with elevation and you find it is colder and snowier as you drive just a short distance to Lake Louise, and then again, just a further short distance up the Icefields Parkway to the Bow Summit area which you will find is colder and snowier still! The main weather pattern in The Canadian Rockies is prevailing moisture-filled Westerly winds blowing across British Columbia from the Pacific Ocean. 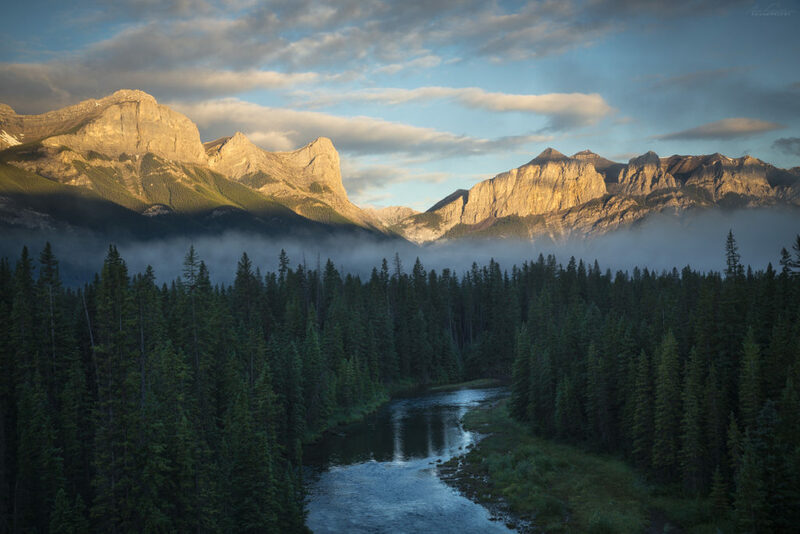 When the wind hits the continental divide (The high point of The Canadian Rockies separating Alberta from British Columbia) it releases its moisture leaving the Eastern (Alberta – Banff, Canmore) side drier. It can often be really nice in Banff and Canmore but socked in at Lake Louise which sits right at the continental divide at a slightly higher elevation. 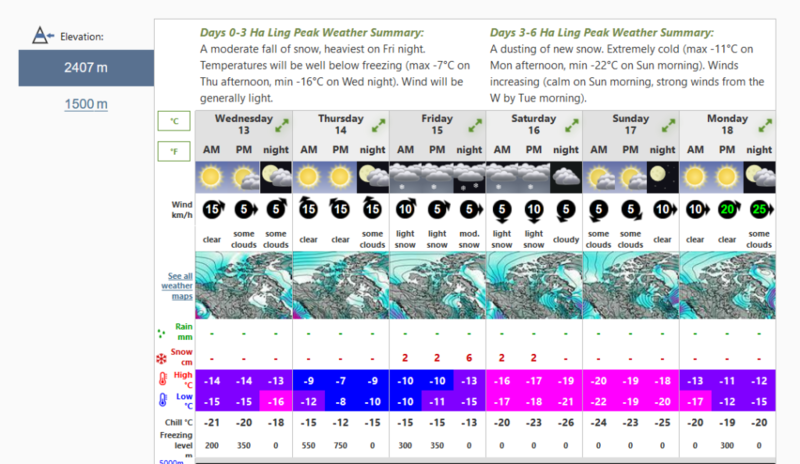 Weather forecasts are only good a day or two out in the mountains, if that! Come prepared with many layers, especially if you are hiking and will be away from the road to get your photos. These two along with the ‘weather network‘ and the App, ‘WIndy’ (pictured below) allow me to get an average of how the day is going to go weather wise. It’s always better to use multiple resources especially if you will be hiking. 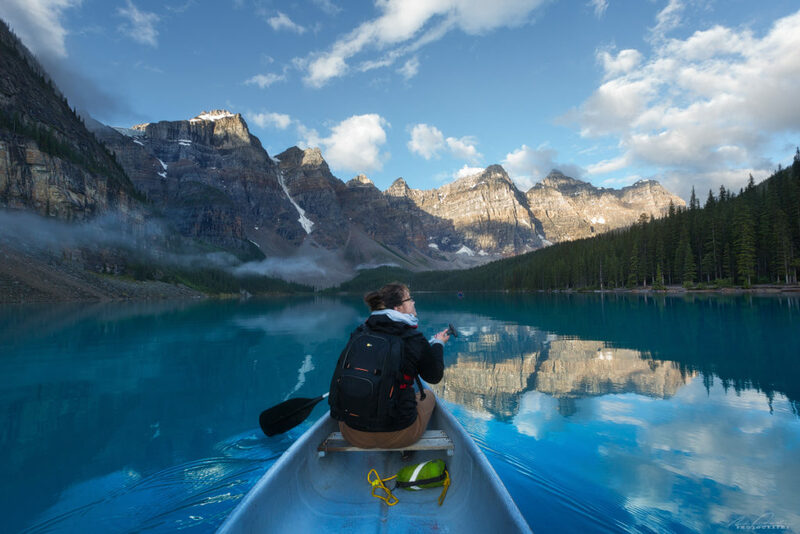 Canoeing on Moraine Lake in the early morning. A bucket List experience in summer! Summer in the Canadian Rockies is very short, but the days are long. This is an ideal time if you will be hiking, camping and spending a lot of time outdoors as there is a huge amount of daylight. 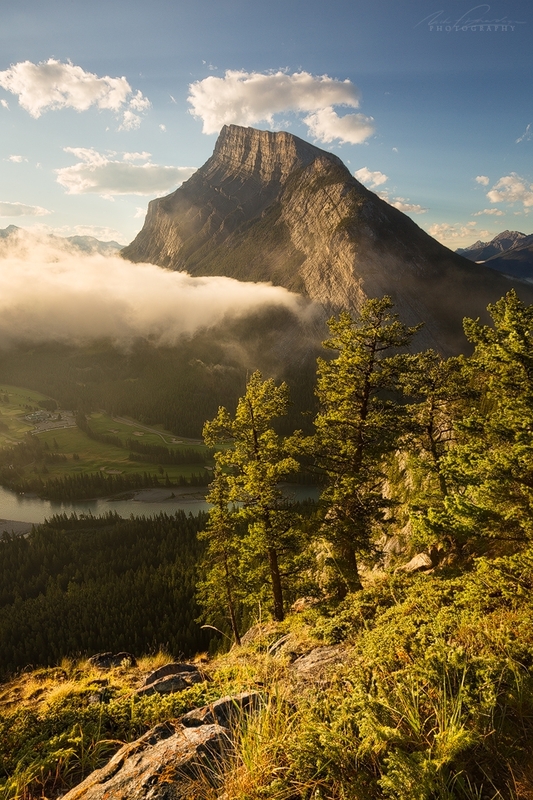 July is the hottest month, with Banff and Canmore’s average daytime temperature reaching to above 23°C (73°F). On hot days, the temperature can hit 30°C (86°F) around the towns of Banff and Canmore in the valley bottom. Daily low temperatures average around 7 °C (45 °F) . Wildfires have been common in the Rockies and neighboring areas over the past couple of years meaning August can be very smoky and the views minimal. This is unfortunate as August also offers the best month to get up high in the mountains where mountain tops and ridges have finally become snow free. Hiking to the top of Mt Temple in Lake Louise used to be annual event for me and now I have to monitor smoke levels before committing to such a long day hiking! The first snowfalls can arrive right at the end of August around the Lake Louise area! 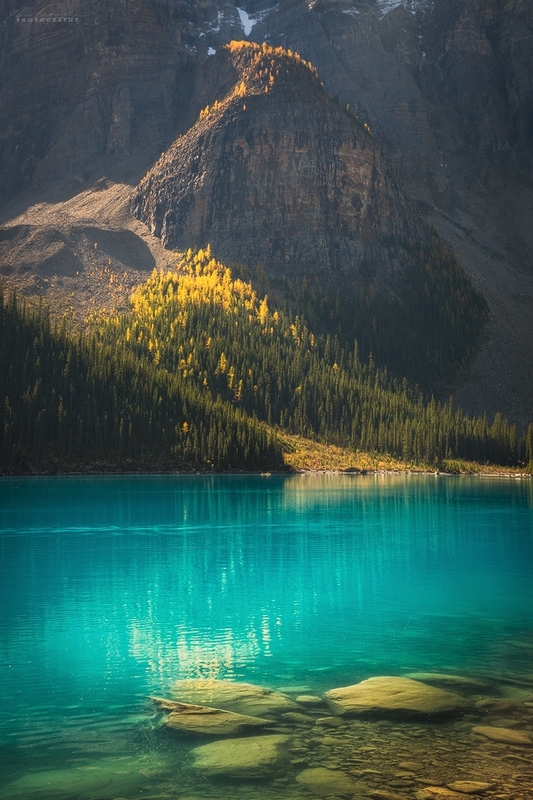 It is going to be busy at this time of year so steer clear of the iconic locations like Moraine Lake or Lake Louise unless you go for sunrise. 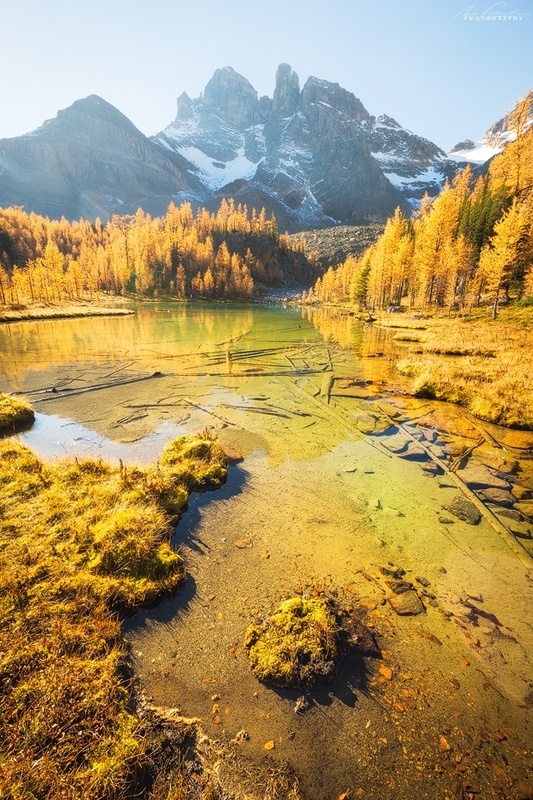 Hike to beat the crowds – even explore backcountry camping or staying in a hut as a base as these places get very peaceful around the edges of the day. 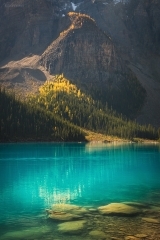 Book well in advance (usually January) through online reservations – Egypt Lakes and the Skoki area, both in Banff National Park would be my recommendation, and the Lake O’Hara or Mt Assiniboine areas. Helen Lake-Cirque Peak, Wilcox Pass, Caldron Lake, Bow Peak, Saddle Mountain-Mt Fairview, Takkakaw-Laughing-Twin Falls, Rockbound Lake, Smutwood Peak, Bourgeau Lake-Harvey Pass, Paradise Valley and Wenkchemna Pass are some of my recommended day hikes to beat the crowds. These all offer superb opportunities for unique landscape photos as they are just a bit more work to get to than the roadside locations. Summer is the perfect time to stretch the legs and go the extra yard for the shot. You are much more likely to come away with something unique too. Make sure to be properly prepared on all of these adventures – maps, bear spray, leaving a plan with an emergency contact, traveling in a group, and carrying water, food and equipment to cover all of your needs. 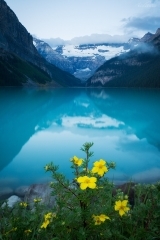 Visit The Icefields Parkway and photograph some glaciers! – they are much more visible in summer clearly contrasted against the brown sedimentary rock. These might not be around much longer with the effects of climate change being especially visible here in The Canadian Rockies. 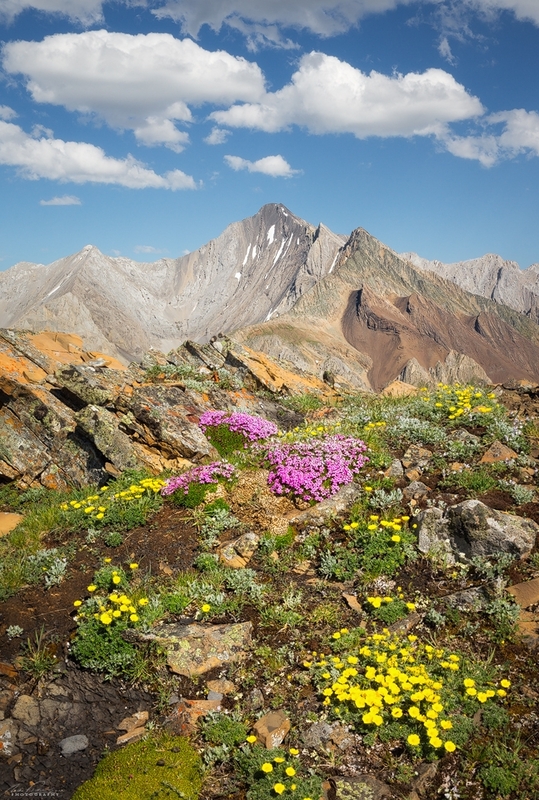 Wildflowers peak from late July through until early August – Numa Pass in Kootenay National Park is especially filled as is every other alpine meadow! Foregrounds galore! This is my favorite time of year in the mountains – cool, crisp fall air and very unpredictable atmospheric weather. 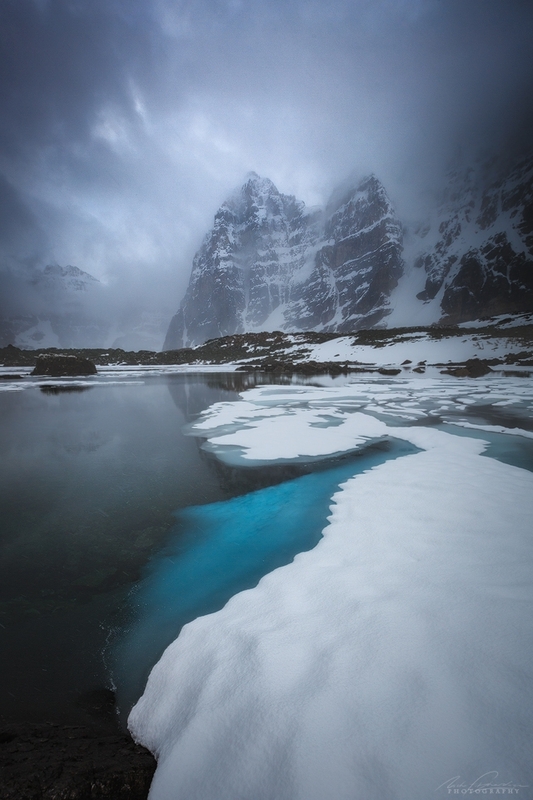 The highest temperature variations of the year occur at this time from between 30°C (86°F) to as low as to 4°C ( to 20°F) and sometimes even lower especially if you will be in the alpine where sub zero temperatures become common overnight. Big snowfalls can happen at this time too and it can sometimes be uncomfortable to shoot in the wet snow which then freezes overnight. The photogenic backdrops of a fresh dusting of snow on the peaks, fall colors from the alpine larch and trembling aspen trees, open water on the lakes, and still mostly accessible trails more than makes up for any discomfort. 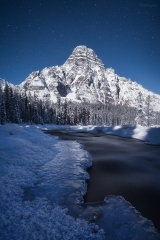 Mild weather can continue until early December, but generally the first significant snow falls occur in October, and by mid-November winter has set in and the ski resorts begin opening. Don’t forget the Trembling Aspens which usually peak mid September They are a bit later in Jasper with it being further North – so early October. 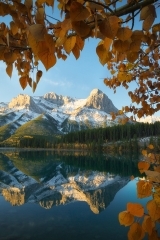 These are great all along the foothills and front ranges of the Canadian Rockies like around Barrier Lake, Yamnuska, Abraham Lake & spotty patches throughout Canmore and along the Bow Valley Parkway between Banff and Castle Junction. Purchase gaiters – They save the discomfort of snow in your shoes as you explore. Winter is long in the Canadian Rockies and days are very short in December/January – not a lot of vitamin D and a weak low angled sun that doesn’t reach far above the horizon throughout the day. 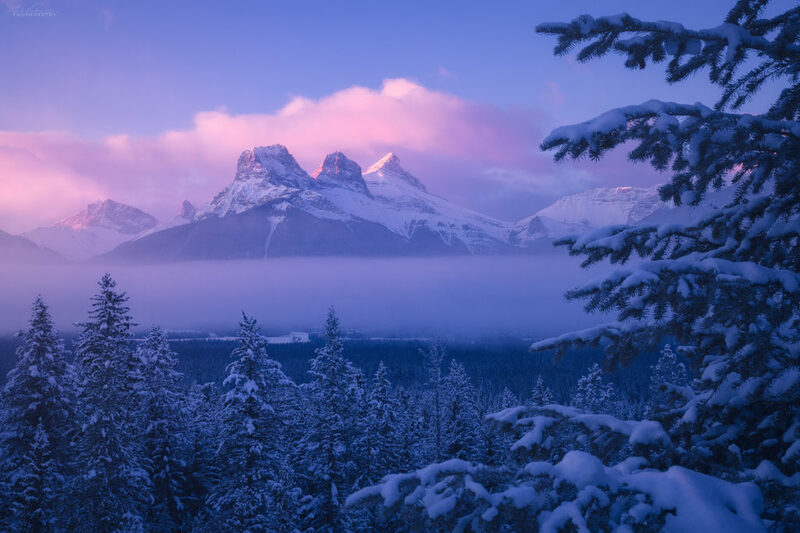 January is usually the coldest month, when Banff’s average low temperature is −15 °C (5 °F) and the mean high temperature is −5 °C (23 °F). However, temperatures can drop to below −20 °C (−4.0 °F) and wind chill values dropping below −30 °C (−22.0 °F). The coldest temperature recorded was – 52°C (- 62°F), in Lake Louise on January 25, 1950! The cold is a dry cold, unlike the damp cold experienced in coastal regions. Cold temperatures and snow can be expected right through until mid-March. 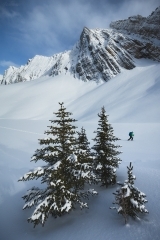 Great skiing can be had especially in January – March and there are winter festivals on display in Banff, Canmore and Lake Louise at that time as well. 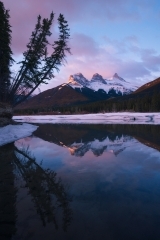 During winter months, temperatures in Banff can be drastically warmer than expected, especially compared to other areas of central and northern Alberta, due to Chinook winds (‘Chinook’ is a label for the indigenous Chinook people of the lower Columbia River, not meaning ‘snow-eater’ as some report it to mean). These are frequent and strong in the Eastern slope foothills of The Canadian Rockies and bring winds between 30-50km per hr (but sometimes up to 100km/hr) so the warm temperatures come at a price! Often they are also identified by a ‘Chinook arch’, a cloud band paralleling the Rockies, which is extremely photogenic. Temperatures can rise 30 degrees Celsius in just a few hours during this phenomenon! Lenticular clouds forming can signal the development of a Chinook. Thin gloves which can be put inside larger winter gloves allows for a good workflow for camera operation in cold temperatures. I use mitt versions of both to keep my fingers together otherwise I’m prone to the odd finger turning white during extremely low temperatures. Frostbite is a real risk! Have a huge down jacket – my favorite piece of gear which makes -30 Celsius seem warm! Hand warmers and toe warmers – I’ve heard they can keep cameras going at night in winter so they can be versatile. Keep spare camera batteries close to your body. Chase the Ice bubbles, trapped methane gas frozen in bubble stacks! 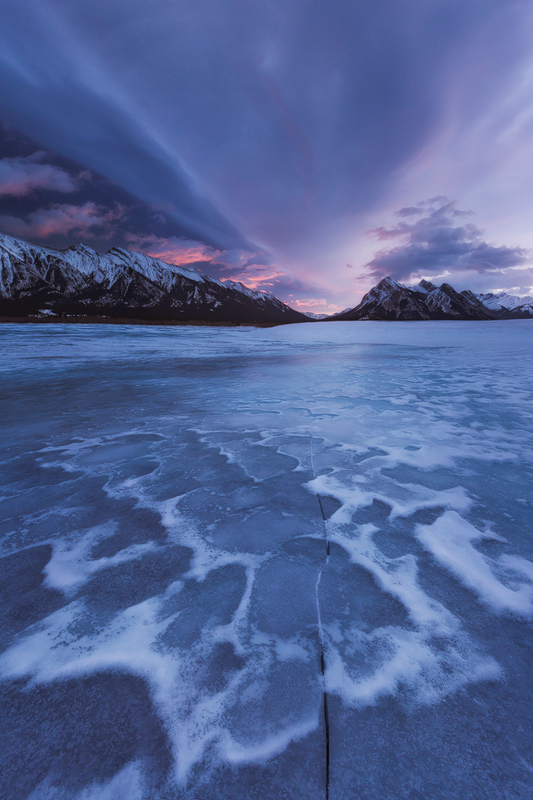 Abraham Lake – Preacher’s Point and The ‘Belly’ of Abraham are a great place to start. Lake Minnewanka and Spray Lakes also offer good opportunities as long as the snow hasn’t settled on the surface of the lake (or can be blown off by the wind). Abraham is usually a sure thing, the others you need to catch them at the right time before the snow settles for good which is sometime before early January depending on the snow and wind conditions. The edge of The Bow River is an exceptional place to be for icy foregrounds and rising steam from the much warmer (but still freezing cold) water. Castle Junction is my favorite area for this. This also goes for the Athabasca River in Jasper National Park. Get out photographing immediately after snowfalls – the trees are plastered but this is not always the case especially when a Chinook wind arrives and makes the spruce trees lose their snow. In other words ditch the well paying snow shoveling gig you have on the side (like I did). Get out on a set of snowshoes or skis and immerse yourself in this winter wonderland. I haven’t done this enough but the photography opportunities are amazing. An avalanche awareness course, partners and the right gear is essential for most of these opportunities. 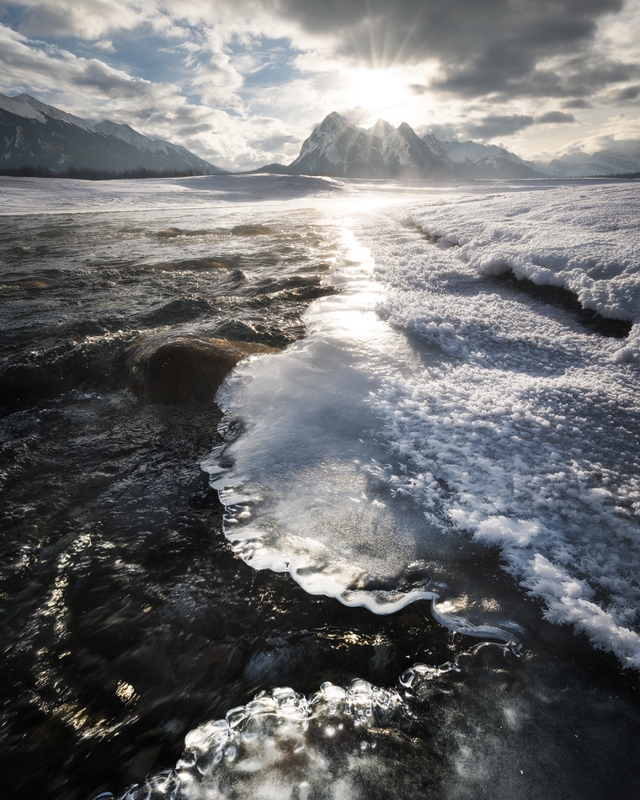 Vermilion Lakes in Banff has a few sections of open water at the second and third lakes due to the Sulfur springs originating near Cave and Basin on Sulfur Mountain bubbling up in spots. 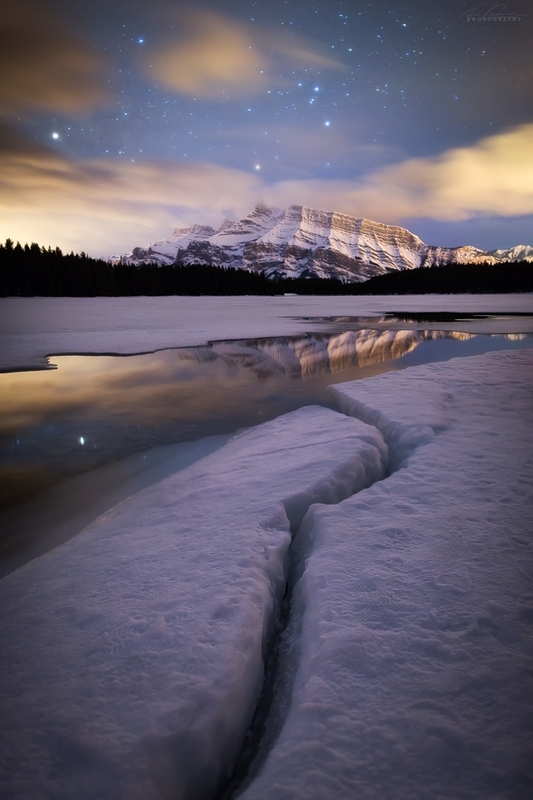 November and March/April can be very interesting at this spot as the ice is starting to freeze (or breaking up) providing great foregrounds and the sun is rising right behind Mt Rundle. Light Rays and spectacular back lighting at sunrise are always a chance! 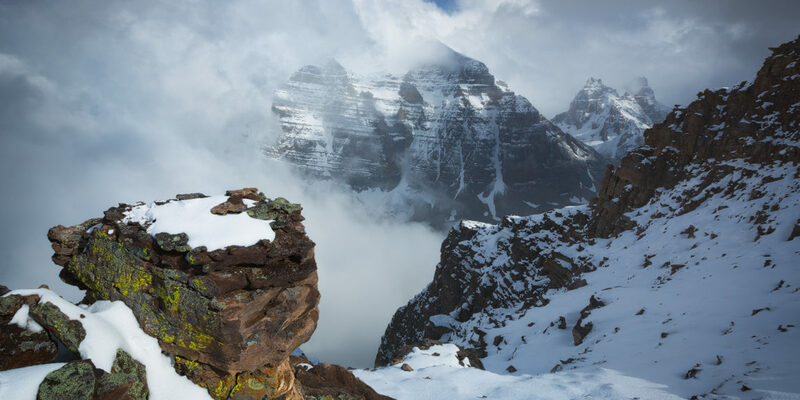 If an inversion happens where cloud is stuck in the valley floor see if you can get above it at a ski resort or at the top of the Banff Gondola. This can look spectacular from above! (This can happen at anytime of the year – try to get above it, it looks awesome). Spring is delayed in the mountains until May-June. Many lakes may remain frozen into June, and snow cover on higher mountain hiking trails remains until early July. During this period of the year, there is more rain than usual, wildlife begins to emerge and everything starts to look very green. The average daytime temperatures in May are generally around 15°C (58°F), whereas the minimum average temperatures during the night are around 2°C (about 35°F) with these values rising slightly into June. 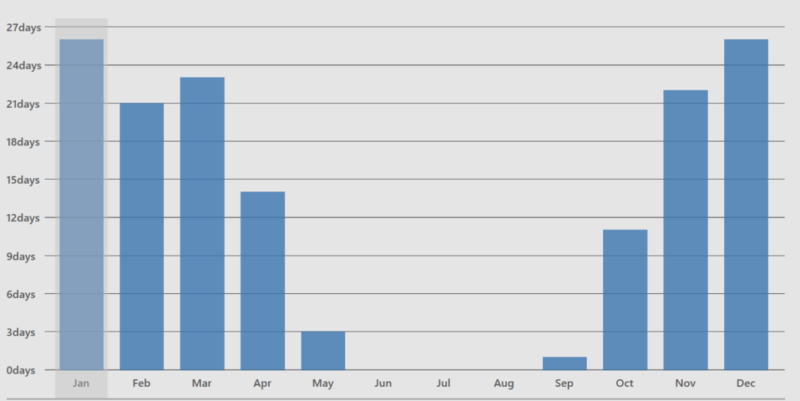 June has the ‘Monsoon June’ tag and averages about 9 days of rain in the month. The dramatic flooding of Canmore (and Alberta) that occurred in June 2013 was the worst in Alberta’s history. 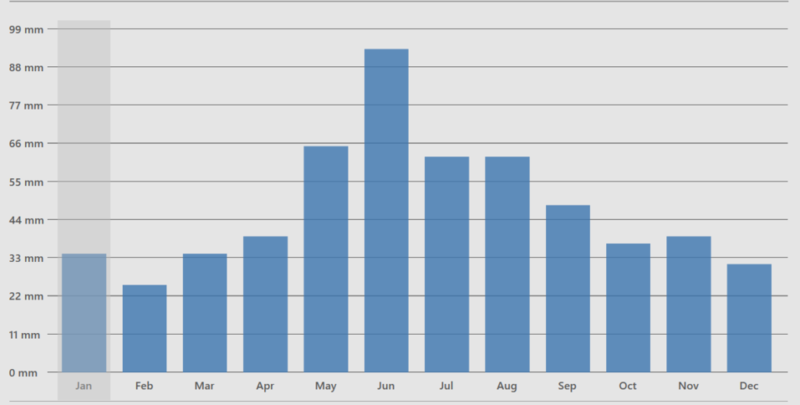 In recent years this time has been much warmer than usual and summer has made an earlier appearance. 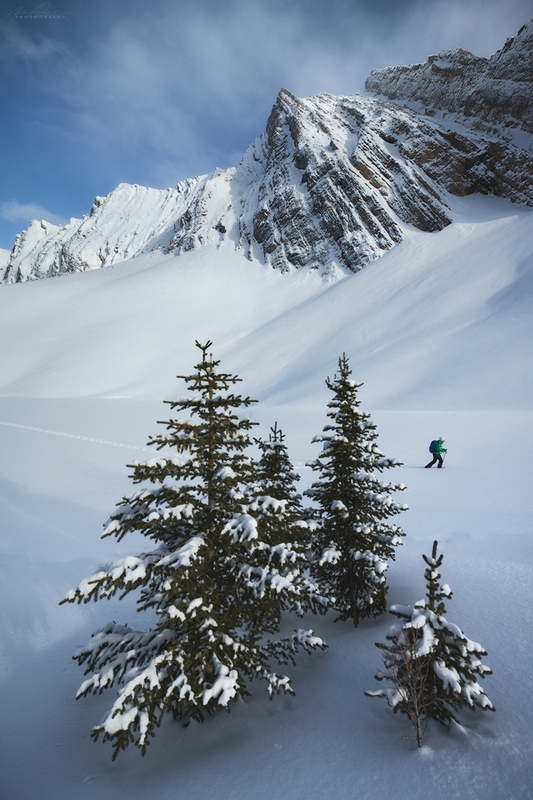 Crowds are much less and it is one of my favorite times of the year in the Canadian Rockies. It is still very snowy especially around Lake Louise and Bow Summit but instead of a small amount of snow to walk through you might have a whole lot of the residual winter snow to ‘post hole’ through. Gaiters are essential to any exploring and avalanche danger is still present. 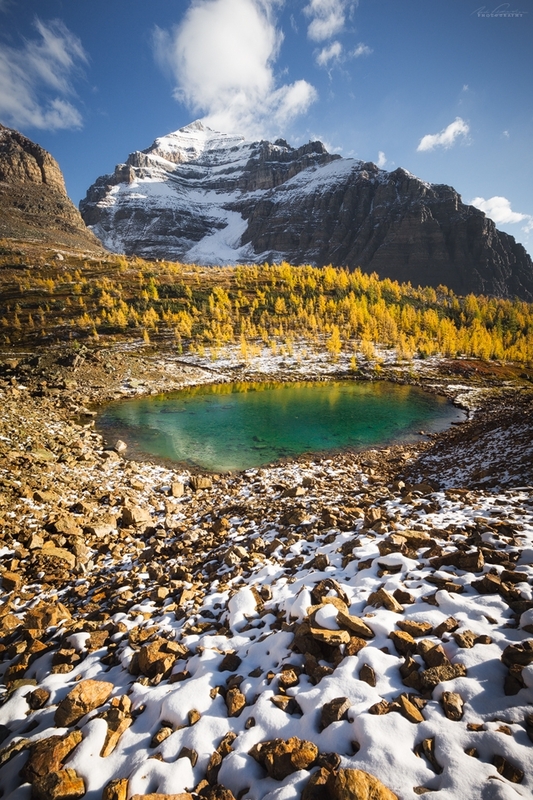 Lake Minnewanka and its trails and campsites are one of my favorite areas during Spring – in particular Aylmer Canyon campsite (Lm8) nestled among the green Trembling Aspens. The whole Minnewanka Loop Road is a great place to spot wildlife at this time of year. Driving through Kananaskis on Spray Lakes Road is also another great spot to be at dusk or dawn for this. 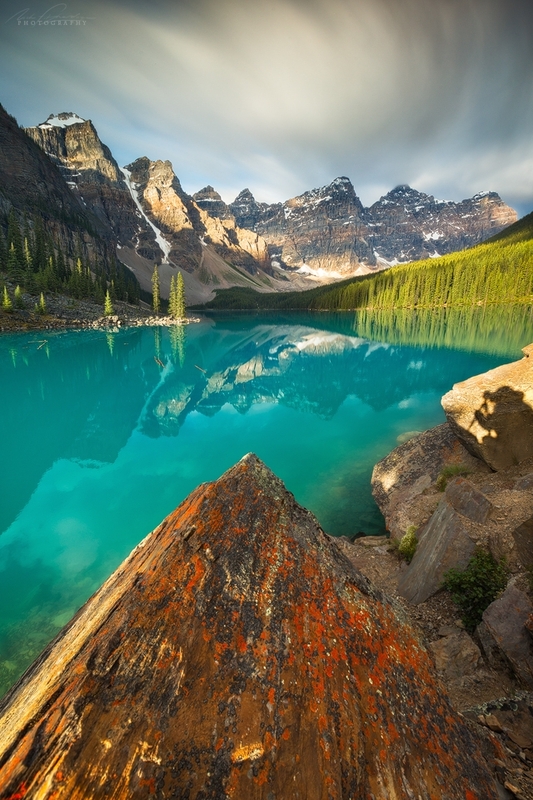 Moraine Lake Road reopens in the third week of May. Hooray! Get in early (as in Late May/Early June). One of the best times but be prepared to wake up extremely early for sunrise due to the long daylight hours. 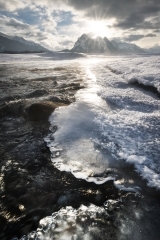 Water flow is extreme as the snow melts and the temperatures begin to heat up the glaciers melting them more rapidly. Johnston Canyon, Marble Canyon, Athabasca Falls, Sunwapta Falls, and all the waterfalls in Yoho Valley are all pumping. It is a sight to see! I love to photograph the front ranges at this time of year and often a lot of good hiking opens up earlier here too – areas around Canmore and Kananaskis especially – Windtower Mountain is one of my favorites at this time. Keep your eyes open for more atmospheric weather as temperatures begin to fluctuate from below to above freezing throughout the day and this can generate low valley cloud which is a very nice touch in a landscape photograph. I hope that this brief guide to the weather helps you plan your trip and photography objectives while you are in the Banff and Canmore areas of The Canadian Rockies! My favorite time of year for photography is September-October and that is largely thanks to what the weather is bringing to the table. Watch for atmospheric phenomena at any time of the year to give your photos a different edge to them as well. The best hiking is from May-October with different regions offering the best conditions within that timeframe. See some more great photography spots in Banff National Park by clicking right here. 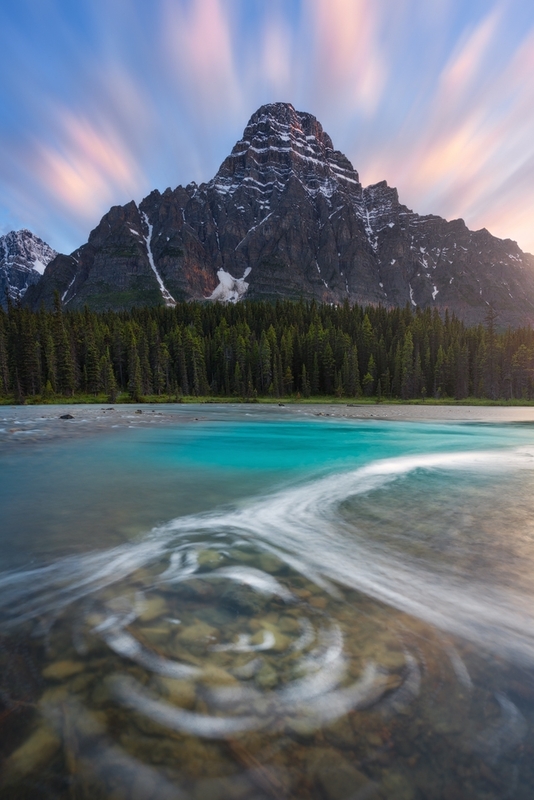 I also have much more information on Banff, Canmore & The Canadian Rockies photography tours, workshops & adventures which you can hear about first by signing up to my mailing list below. I look forward to sharing all the great things to do in this area with area with you!